Trees are what help make Tualatin beautiful—so tree removal and pruning requires special care. That’s why the City of Tualatin has taken specific measures to protect and preserve trees. That said, sometimes a tree needs to be removed. Given their importance to the community and environment, it’s best to use certified arborists. 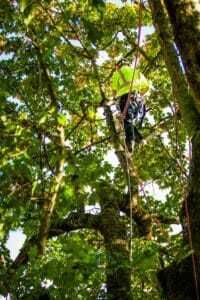 Urban Forest Pro has serviced the City of Tualatin with tree removal and tree pruning for over 15 years. We have the expertise to diagnose unhealthy trees and the experience to revive or remove them effectively. When rot, decay, or large cracks are present, it often means the tree is irreparably damaged and needs to be removed. If you suspect any of these signs, it’s best to call tree removal specialists. Large trees have the potential to cause a lot of damage to your property (as well as surrounding properties). The longer you wait, the more dangerous and expensive it can become. 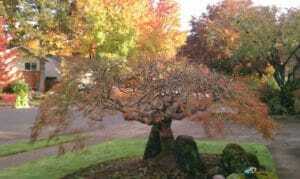 The City of Tualatin has many regulations in place to preserve trees. We can help with securing permits and determining which trees to remove, as well as forming the best approach for doing so. Pruning is crucial for tree health in Tualatin, especially given our volatile winters. With fruit trees—the majority of our trees—it can also help yield larger harvests. We can help prune in order to adjust the tree’s shape, to clear walkways and the home’s visibility, and to remove decaying branches. When trees are professionally pruned, it can significantly expand their lifespan. It can also prevent accidents, as it can be tricky business for the average homeowner. Removal is nearly always best left to professionals. Our arborists at Urban Forest Pro are licensed, bonded, and insured. We’ve secured the trust of Tualatin and beyond by providing quality, cost-competitive services for over 15 years. Call our office at 503-226-7143 for a free estimate.